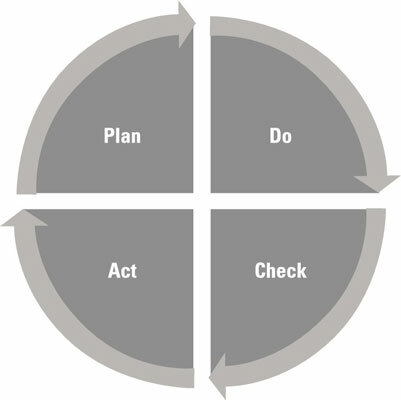 W. Edwards Deming popularized a tool called the PDCA cycle for continuous improvement. Managerial accounting runs in cycles of different lengths. Certain sales reports and controls may be repeated every day. Some reports may be prepared every month, or each quarter. Others may be prepared just once a year. Establish your objectives and how you plan to achieve them. In the scientific method, the equivalent step is creating your hypothesis and prediction. Ripe OJ’s orange juice processing plant experiments with a new technology (the plan) to squeeze more juice out of oranges (the objective). Implement the plan — you make it happen. In the scientific method, this step is the test of your hypothesis. Ripe OJ’s processing plant sets up the new technology and tries it out on real oranges. Measure to determine what happened. The scientific method calls this step the analysis. Ripe OJ’s managers measure how much orange juice the new technology produced. Did the new technology actually squeeze more juice out of the oranges? Unfortunately, no. It squeezed less. The plant can usually produce 600 gallons in one batch. It expected the new technology to yield 700 gallons. Instead, the process yielded only 550. Think about root causes that may explain the differences between actual and planned results. To close the cycle of improvement, act on a new plan to implement and test these root causes. This stage reflects the scientific method’s commitment to evaluation and improvement. Ripe OJ’s managers call in the engineers to try to figure out why the plant produced so little orange juice. After much discussion, the engineers and managers believe that the shortfall was caused by a junior engineer’s forgetting to plug the big contraption into the wall outlet. They plug it in and try again, returning to the plan stage (Step 1).